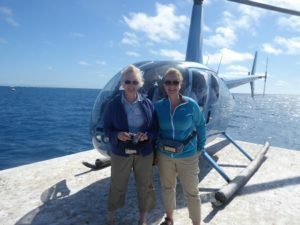 We had pre-booked a 10 minute helicopter flight (my birthday present to Gill) and were quite keen to do a small group guided snorkel tour. 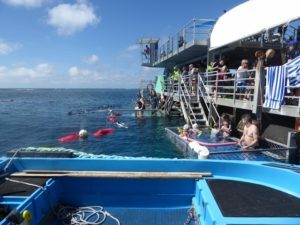 Whilst I appreciate that they had a fairly limited time to get a large number of people organised into doing a whole range of different activities, it felt very frenzied as we were being pushed to book in our times when we really had no idea of what anything would be like when we got out to where we were going. 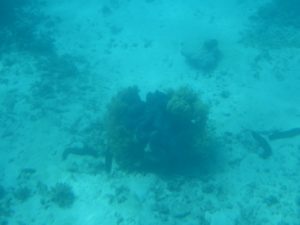 In the end we agreed to the second time slot for snorkelling and were given a time for the helicopter flight that would give us just enough time to get changed and ready after the snorkel. 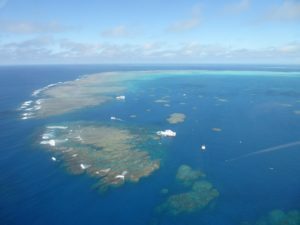 The catamaran was super fast so the boat trip out to the Outer Great Barrier Reef took just 90 minutes and we had morning tea served on board. 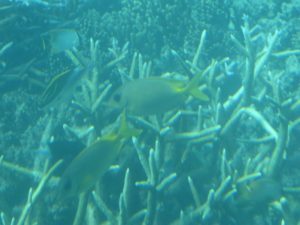 We pulled up alongside the “Marine World Activity Platform” which was basically a large permanently moored pontoon – it looked tiny when we arrived but did manage to cater quite well to everyone’s needs. 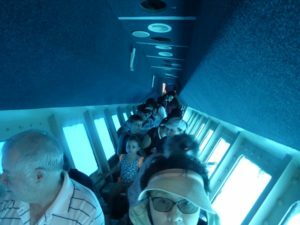 Included in the price were complimentary 30 minute tours in a glass-bottom boat and a semi-submersible. 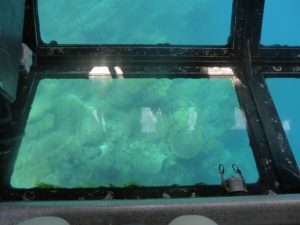 We were standing in the right place when the first tours were announced to go in the semi-submersible: basically a boat with a glass hull so you sat down and looked out underwater as it toured around the outer part of the reef with a guide pointing out what you were looking at on the way. 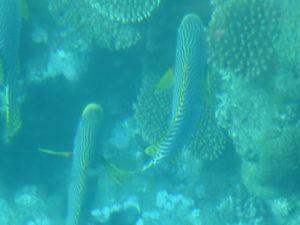 We got back in time to locate wetsuits and changing rooms, grab snorkels and flippers and meet up with our guides for the snorkel tour. Gill isn’t a confident snorkeller so this was a perfect approach as we are in groups of 4 people with a guide, they take time to make sure everyone is comfortable before we slide off the snorkel platform all hanging on to a life buoy that the guide pulls us around on whilst explaining what we are seeing, types of coral, fish etc. It is only 30 minutes but we are satisfied that we have seen a lot of things. 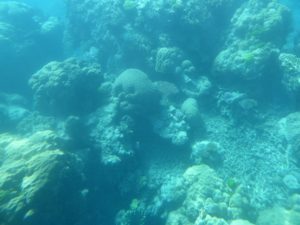 We even got photographed underwater by the boat’s photographers. 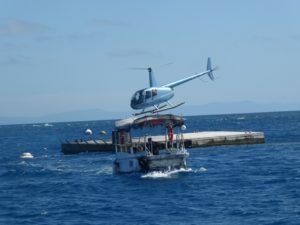 As we come back onto the pontoon our helicopter chap tells us that we will be delayed a while, so we have time to get changed (there is a fresh water shower) and to have some lunch. There is a buffet lunch with all manner of dishes including fresh prawns, salads, and fruits – served over 1.5 hours so there is plenty of time for everyone to get some no matter what their activities. For the helicopter ride we are taken out in a little boat to a concrete platform where the helicopter lands. 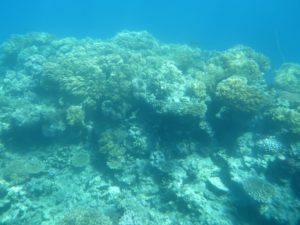 We have to leave everything but our cameras on the boat and are given life jackets along with detailed instructions as to what we should and shouldn’t do. It is a rapid turnaround time between flights and we are settled into our seats, buckled in and given headsets ready for take-off. 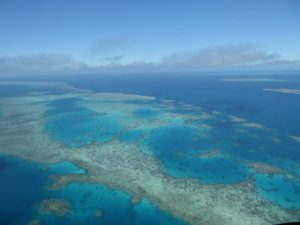 10 minutes doesn’t sound like very long but once you are up in the air it is actually a reasonable length of time to get a really good view of the reef and to get an impression of the vast size and how it is made up of a string of individual reefs rather than one long continuous reef. It is certainly a fabulous experience that we both really enjoyed. 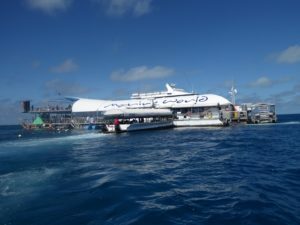 We arrived back at the pontoon just a few minutes before the next tour on the glass bottom boat was about to depart and were at the front of the queue. 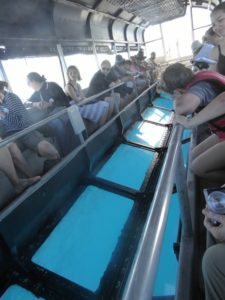 The glass bottom boat gives a very different perspective from the semi-submersible and goes around a different part of the reef including over the shallower coral garden area where there are lots of smaller fish. 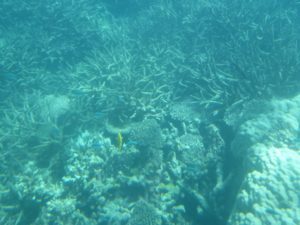 Whilst many are out snorkelling until the very last moment, we are satisfied that we have got to experience a lot of different activities and different views of the reef and its inhabitants, so we are happy to have a cuppa and enjoy just being out on the water. After a while our spot becomes crowded as the photographers are laying out the photos of every one doing their different activities and people come in their droves to pay vast fortunes for photographic memories of their day – we are happy with our own shots. 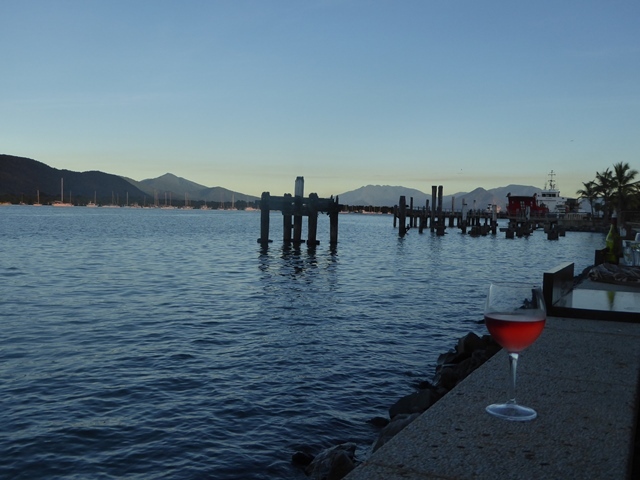 We arrive back in Cairns at 5.00 and wander around the marina area, enjoying a drink looking out over the river as the sun went down at a bar with tables right on the water’s edge before making our way to a Turkish restaurant that had caught our eye earlier in the week: I enjoy the chargrilled prawn skewers with calamari. Then we stroll back along the esplanade to the hotel feeling very satisfied with our day.